Design an investment strategy that adapts to changing market conditions. Proactively capture your sources of return. Omega Point's AI-based Market Aware™ engine unlocks portfolio performance with unique insights that help capture the sources of your strategy's performance and reduce external noise from the markets. Identify the most critical factors driving your portfolio risk and manage their impact to your strategy. Our Market Aware algorithms help uncover even the most subtle shifts in market trends to help isolate the value drivers of your portfolio. 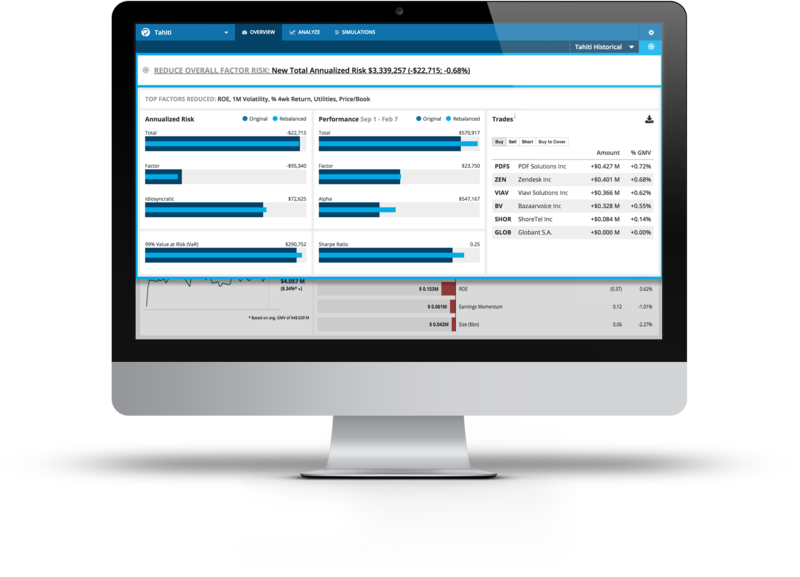 Omega Point's easy-to-use web-based analytics platform is a one-stop strategy analysis dashboard that provides managers with an in-depth view of the factors that are driving their portfolio's performance. Our comprehensive factor model library, with coverage of 70,000+ securities, allows you to quickly build a multi-dimensional view of your portfolio’s exposure in real-time to market factors across styles, sectors, regions, and asset classes. AI-driven market detection patterns are seamlessly integrated with your own, unique investment style. On average, Omega Point has helped reduce portfolio factor risk by 30% and increased overall returns by 14%. Omega Point's Developer Platform allows you to pull our data and factor analytics directly into your internal systems, applications and most third-party platforms. When used with Omega Point’s powerful application workflows through Portfolio Intelligence, the result is an organizational win-win that enables closer ties between PM’s, development teams and the middle/back office. All managers, whether passive or active, can take advantage of AI-driven quantitative insights without sacrificing their own unique investment style. NEED Discover unintended risks across multiple portfolios. GOAL Robust integration into the organization's strategy analysis workflow. USE Directly integrate analytics into existing PM-facing systems. RESULT Reduced risk, clear reporting. More efficient collaboration between PMs, analysts, and quant teams. NEED Quickly evaluate new strategies for undesirable factor risks. USE Simultaneously backtest multiple strategies and minimize risk imbalances. RESULT Better strategies that preserve ideas, increase alpha. NEED Manage model portfolios serving both institutional and retail client base. USE Leverage Omega Point across the full design-analyze-deploy-monitor lifecycle of each model portfolio. RESULT Increased innovation and adaptiveness to client needs. NEED Identify unintended factor risk. USE Actively monitor any changes in factor risk and adjust factor hedges. RESULT Implement more adaptive hedging strategies.